Do you collect vintage Christmas decorations? I used to collect just little angel figurines from Napco or Lefton that I remembered from my childhood, but now I pick up other vintage decorations as well. Today I'm sharing some of my recent vintage Christmas finds. These items have never been in any of my previous Christmas posts. Even if you don't collect vintage Christmas, I think you will remember some of these old Christmas collectibles, or some like them. A vintage cloth and plastic Santa from the 1960's. 8 1/2" tall. Maker unknown. This plate and bowl are from the "Holly on White" pattern from Waechterbach. The pattern has been discontinued. This is a 1961 Inarco Santa mug. The cold paint is extremely easy to wash or scratch off, unfortunately. This is a Swedish Dala horse. I don't know the age for sure or value. I think these horses are fairly collectible. Also a Dala rooster. Not sure of age or value here either. This is a 1960 Holt Howard Santa and sleigh. It originally had chains in Santa's hands that were attached to a white reindeer. Very kitsch! A Little Golden Book "Rudolph the Red Nosed Reindeer" priced 25 cents and printed in 1958. A 32 page Christmas song book copyright 1936 by Treasure Chest Publications. A vintage Christmas pattern tea towel. A brass Swedish Angel Chimes still in the box. It has been used. Not sure if will keep this or not. I may resell it at a consignment shop. The candles make the angel carousel spin. A 1975 Santa with kitten Hallmark miniature, and a rocking horse wooden Christmas ornament made in Taiwan. Two little boxes of miniature glass Christmas ornaments. A few were missing. And lastly a couple of vintage elves. 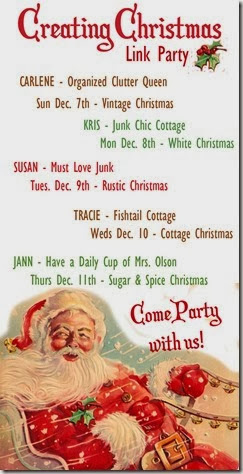 I will be joining Jann Olson from "Have a Cup of Mrs. Olson", and three other bloggers for a Creating Christmas Link Party. I will be kicking off the party on December 7th with "Vintage Christmas". Please join us! See where I put these new pieces and my other vintage Christmas decor! Love your vintage Christmas and many of those items bring back memories for me. I will try to join in the linky party. Sounds like fun! I love vintage most Vintage Christmas items but my all time favorite is those large plastic lawn decorations...Tacky I know but I just love them!! :) I think I will have to do a blog post on them...Thanks for the inspiration!! If you are talking about blow molds that light up, I did a post last Christmas on them too! Carlene, I can hardly wait! I hate that Thanksgiving is so late this year. My kids give me such a hard time if I start decorating for Christmas before Thanksgiving. May just have to start in the Living room any way. Love your new finds! My fav is the Santa, the books, and the vintage ornaments. Everything is great though! I'm so excited to see your vintage displays! I am loving old reindeer and Santa. Have just a few, but keeping my eyes out for more. You just brought back so childhood memories to me. I had a 1961 Inarco Santa mug...actually, I still have it even though a lot of the paint is missing on it. Also had the books and several of the little rocking horse ornaments. I think you are right. The crown on the Dala is different. Thanks! How exciting! I'll mark you guys on my calendar. Can't wait! I just found a knee hugger elf ornament like yours! Gotta love 'em!